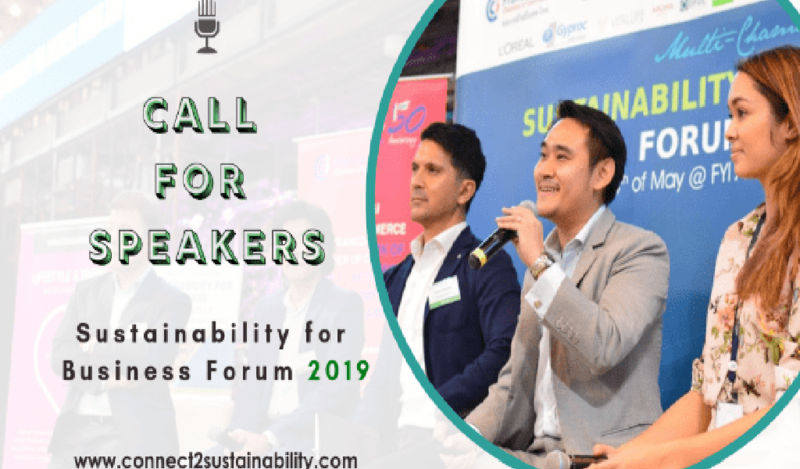 Call for speakers: Sustainability for Business Forum 2019! BSM | Bangkok School of Management - Call for speakers: Sustainability for Business Forum 2019! For companies, sustainability is a clear win-win approach! It includes initiatives and processes which benefit to people or/and the environment and to the company’s profit. If they do they will be convincing for and supported by all stakeholders including business leaders, managers, employees, shareholders, clients and the society. They will succeed to mobilize more resources, grow and be in same time more profitable and impactful. Following up on two previous successful editions, we are excited to announce 2019’s edition of the Sustainability for Business Forum (SBF19) which will be held end of May in Bangkok (date TBC). We are now in the process of selecting business projects or approaches which have leveraged from environmental and social sustainability. In this objective, we are currently offering the opportunity to managers of such initiatives to come and present their successful sustainability project and their results. Please be aware it is a business gathering about business innovations and that NGO or UN projects looking for philanthropy from companies cannot be advertised in the forum.